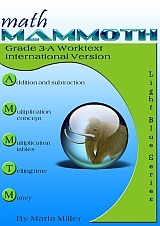 Math Mammoth Grade 3 International Version - description, samples, and purchase info. 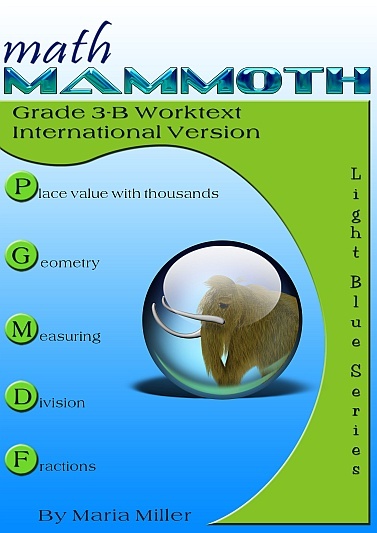 Math Mammoth Grade 3 International Version is a complete math program for third grade. It consists of two student worktexts (A and B), a separate answer key for each, tests, mixed revisions, and in the download version, an additional worksheet maker (Internet access required) to make extra practice worksheets when needed. Students develop an understanding of fractions, beginning with unit fractions. They use fractions along with visual fraction models and fractions on a number line. They also compare fractions by using visual fraction models and strategies based on noticing equal numerators or denominators (chapter 10). Students fluently add and subtract within 1 000, both mentally and in columns (with regrouping). They learn to add and subtract 4-digit numbers, and use addition and subtraction in problem solving (chapters 1 and 6). Please also see the table of contents for 3-A and 3-B (in the sample files), which will let you see the topics covered in more detail. In the download version, the chapter on coins (chapter 5) is included in seven currencies: US, Canadian, British, European, Australian, New Zealand, and South African money. You will automatically get all versions when you buy the Grade 3 Curriculum as a DOWNLOAD. A non-digital clock or other analog clock where you can turn the minute hand and the hour hand will move accordingly (for 3-A). A ruler that measures in centimetres (for 3-B). A measuring tape that measures in metres (for 3-B). A kitchen scale that measures in grams (for 3-B). A measuring cup that measures in millilitres (for 3-B). Fraction manipulatives. The curriculum contains printables to make your own fraction manipulatives. The text uses visual pie models extensively, and students even learn to draw them for themselves in the exercises, therefore making or buying the manipulatives is entirely optional (optional; for 3-B).